LONDON (Sputnik) - The UK authorities have been blocking the renewal of staff of the Russian Embassy in London since the beginning of the year by delaying visa processing time, the embassy's press officer said. In March, the United Kingdom expelled 23 Russian diplomats after the poisoning of Russian ex-spy Sergei Skripal and his daughter in Salisbury. Moscow expelled the same number of UK diplomats in response to London's move. 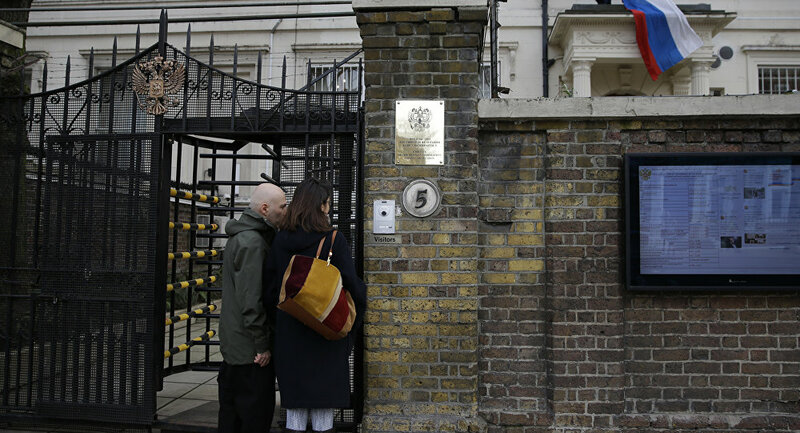 "Since the beginning of the year, the British authorities have essentially blocked the renewal of the staff of the Russian Embassy: neither diplomatic nor technical personnel can receive visas. Such state of affairs is completely abnormal," the press officer told reporters. According to the press officer, the expulsion of Russian diplomats further aggravated "the already difficult situation" of the Russian diplomatic missions in the United Kingdom. "The attitude of the British Side to reduce the Russian diplomatic presence is still there. As far as we can tell, the set of tools remains the same: visa limitations, meaningless extended delays in visa application processing for newly appointed staff members, along with three-month incremental visa extensions for personnel accredited in the UK, accompanied by withholding of diplomatic passports," the press officer noted. On March 4, the Skripals were found unconscious on a bench at a shopping center in Salisbury. The United Kingdom and its allies have accused Moscow of having orchestrated the attack with what UK experts claim was the A234 nerve agent, without presenting any proof. Russian authorities have strongly refuted the allegations as groundless.